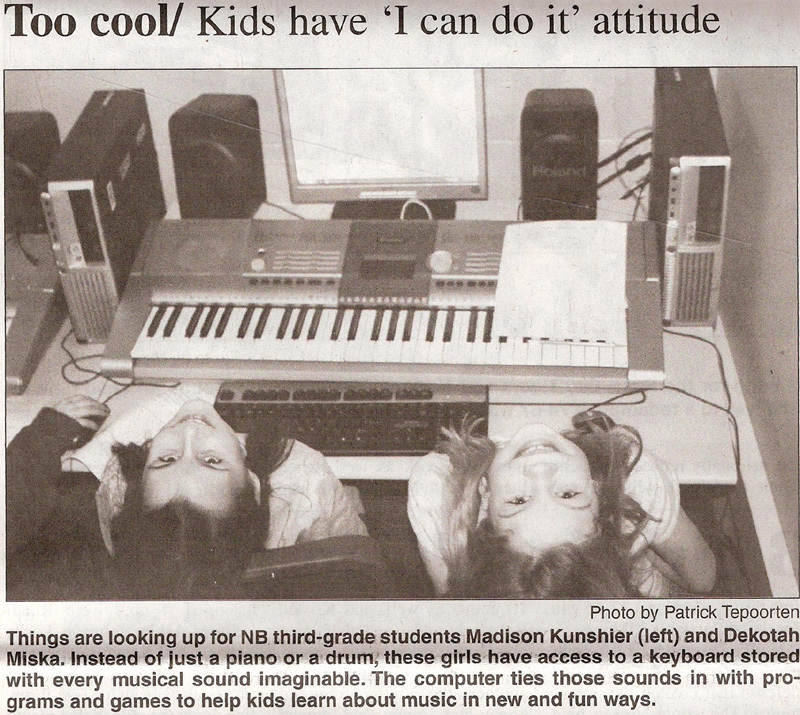 Things are looking up for NB third-grade students Madison Kunshier (left) and Dekotah Miska. Instead of just a piano or a drum, these girls have access to a keyboard stored with every musical sound imaginable. The computer ties those sounds in with programs and games to help kids learn about music in new and fun ways. Carolyn Slater, music teacher at Sunrise School, is using technology previously thought to be too cool for school to help kids explore their creative side and enjoy music in a brand new way. Software and devices, usually the bailiwick of pallid songwriters and engineers laboring in the basement or studio, are now being mainstreamed into the classroom. And, while none of Slaters students are in a position to open his or her own production company...yet, they are getting a type of education in music not historically available in elementary school. It may be difficult for people without an intimate working knowledge of sound production to comprehend the sheer magnitude of advances over the last 15 years. Suffice it to say that what used to require an entire room to house, could cost in the tens of thousands of dollars, and required a trained expert to operate, is now a matter of relatively inexpensive software that a child can use. That means any student with a basic working knowledge of computers and a dash of curiosity, can become a music composer. And they are. In fact, composing music has become curriculum. Using a program called Finale, students are able to reverse compose. In other words, they can improvise music that the software records and transposes into sheet music. An interesting assignment for fourth and fifth graders is showing that kids embrace the chance to be creative, are not at all intimidated by the technology, and given the same parameters will create vastly different themes. Not long ago, these students were presented with a blank music staff and a few rules. Written underneath the staff were words using only the notes of the major scale, like feed and baggage. How students arranged those notes on the staff, or what value was applied to each note was up to them, as long as they adhered to the rules of the time signature. Once that original line of music was written, Slater used the creative program to teach the kids about intervals; each child instructed to add a major third to their unique compositions. A third assignment allowed the students to place their own bass parts into songs, and a fourth allowed them to choose instruments for each part, as well as add a final layer of music based strictly on their own tastes. 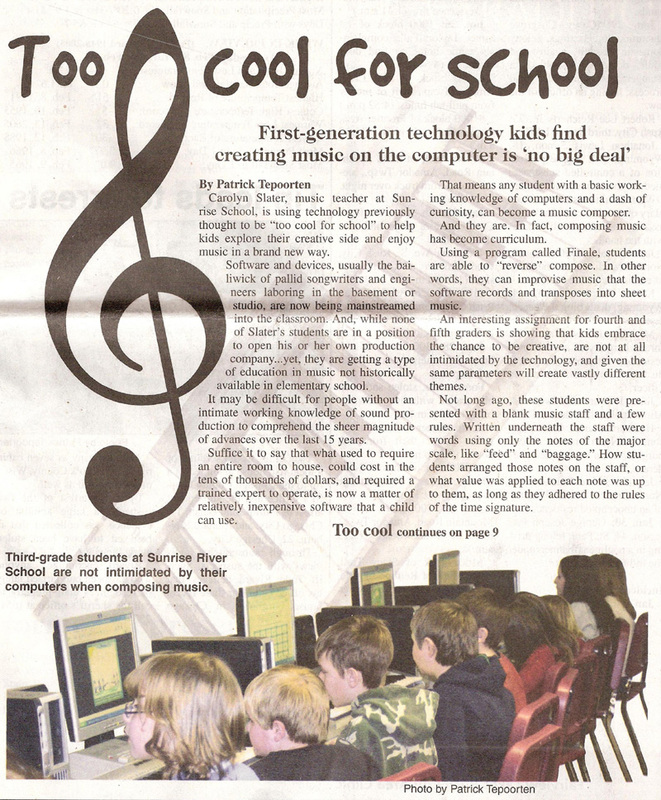 Because the technology is so flexible, students are able to work within their own knowledge of music. So, while one student may be only using what he or she has learned thus far in music class, students with two or three years of private lessons are able to use their knowledge to place flats, sharps, ledger lines etc. That capability means that no one is working under or over his or her ability. Until recently, an education in music at the elementary level consisted primarily of learning to read music, keep time, and recognize the sounds of the more common instruments. Highly regimented and rigid, it left little to no room for students to derive an appreciation for creating music. Thanks to earmarked technology money, Slater can now offer substantive instruction on the creative side of music, putting kids on the directors stage at a young age. The response has been very positive. They really enjoy it, said Slater. They have taken responsibility for their own assignments and are making their own connections to music. And, while Slater stresses that a traditional music education is as vital as ever, she is nonetheless excited about the opportunity to open new doors in music exploration to her students. Making their own connections to music has a big picture component that is hard to ignore. Music is a truly international language. And, though tastes can range from one end of the spectrum to another, most people share a love for music in one form or another. With a better understanding of how music is built from the ground up, students will have an improved understanding of the work that goes into music composition. Fourth- and fifth-grade students will be sharing their creations at parent-teacher conferences this Thursday from 4 p.m. to 8 p.m., and the following Thursday and Friday as well. Slater encourages anyone interested in what her students are creating to stop by for an example of what curious students can achieve with modern tools and a little encouragement.